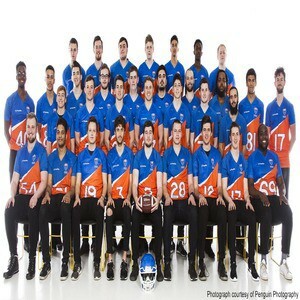 The Eagles, Manchester Met’s American Football Team compete in a BUCS League and play against six other universities on Sunday afternoons between November and March. Last year they recorded their best regular season record, which they’re looking to build on in the coming year. 1st team – Northern 2A. This summer the club has recruited a new high profile head coach, Rick Hurst, along with 10-12 positional coaches who will spend their time teaching you the skills to develop as a player. Training takes place at Platt Lane Sports Complex. The club has strong links with Manchester Titans. For more details on joining a club, please contact sportclubs@mmu.ac.uk. Property of Manchester Met, MMU Sport and any venue they are visiting. To understand the repercussions of any breaches of these standards.